Facebook continued its series of studies with strategic agency Firefly Millward Brown with a look at newlyweds on the social network, finding that most of them are focused on planning and saving for their futures. 2.6 million U.S. Facebook users changed their relationship statuses to married in 2013. Nearly one-half of those weddings occurred between May and August. The median age of grooms was 28, and it was 26 for brides. Married men upload 20 percent more videos than average U.S. males between the ages of 20 and 30. New brides are responsible for 30 percent more comments than average U.S. women between 20 and 30. In terms of wall posts, newlywed men are 40 percent more active and newlywed women 30 percent more active than the average for their respective genders. 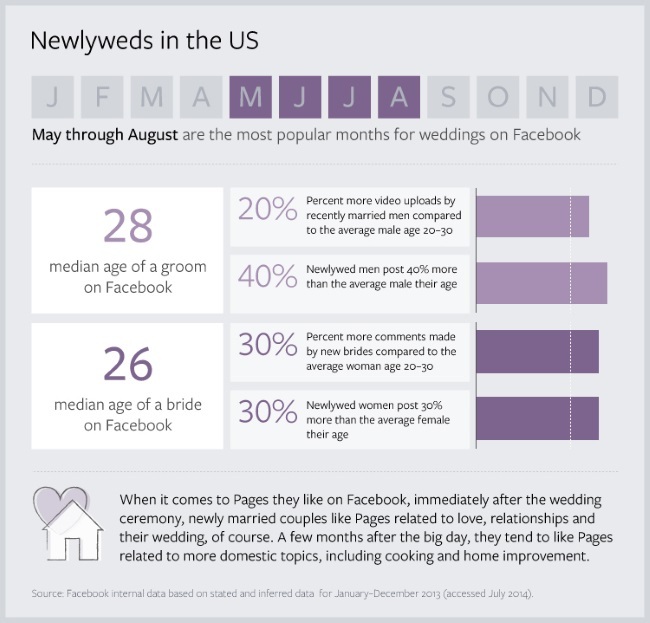 Immediately after their weddings, newlyweds like pages related to love, relationships and their weddings. After a few months, they gravitate toward pages on more domestic topics, such as cooking and home improvement. A penny saved: During this life stage, when newlyweds are intent on saving for their future, paying off debt and building a solid foundation, a key way marketers can help is by offering money-management tips. Encourage them to set up money-saving goals and offer financial vehicles for savings and investments so that they can achieve those goals. Lining the nest: Settling into a home together — either rented or owned — is time-consuming and costly. This is the moment to offer savings on home furnishings and appliances, tips on home decorating and offers of Internet and cable TV subscriptions. Even for couples who lived together before getting married, this is often a time of big purchases together, such as a car or house. Setting the table: Creating comforting food at home is another key part of nesting and a way to save money. Encourage newlyweds to venture into the kitchen with healthy food, recipe and cocktail ideas for quick and easy dinners or more elaborate dinner parties. Readers: What did you think of the findings by Facebook and Firefly Millward Brown?